Jožin z bažin is one of the best known songs by Czech musician and comedian Ivan Mládek. In January 2008, the song became popular in Poland and Hungary, topping several radio popularity polls. 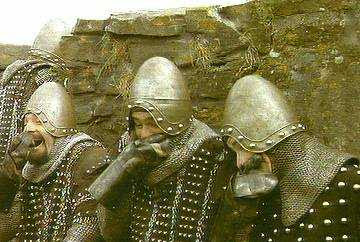 It is also popular in Austria and Russia, sporting a cult following in blogs and several versions of translations. The song is a surreal tale of a mysterious man-eating monster (Jožin z bažin: "Joe from the Swamps") living on the swamps. He could be defeated only with the use of a cropduster. I like that fact that almost every single member of the band resembles Andy Kaufman to some degree and the guy who comes in at about the two minute mark looks like he might have been related to the weird little guy in The Nitwits. That said, it's catchy but it's no "Kuliki Taka". 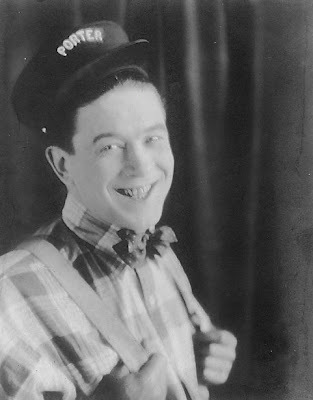 Edwin "Poodles" Hanneford as a train porter, from one of his silent short films. That's Frankie Saluto in the center. 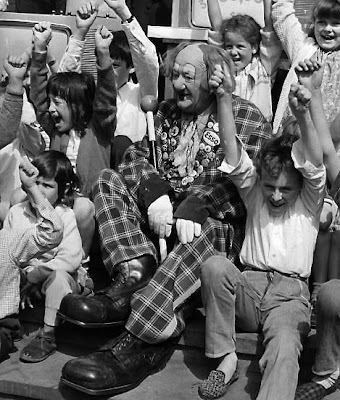 Can anyone identify the two other clowns with him? "The THEE-UH-TAH, the THEE-uh-tahhhh, what's HAPPENED to the THEE-uh-tahh?" That plaintive question can be applied to the circus in America and elsewhere... What's happened to the circus? There are many good folks who are endeavoring daily to carry on the traditions... and there are again, so many good folks, good acts that have passed and are passing into history... and there would seem to be fewer and fewer new folks carrying on in that tradition of excellence. We could blame many different causes... radical racketeering type groups, burgeoning regulations, the economy, lack of interest in traditions, modern media and entertainment....even laziness... but, circus hasn't disappeared... not yet... not by a long shot. Granted there are some out there who might appear to be clueless as to what makes for a skillful and classy show... granted there are those who just "walk through" the steps in performance... granted there are some out there who are just plain discouraged. But showmanship requires vision, nerve, skill, ability, the will to produce and display performances that enthrall, captivate, and inspire. 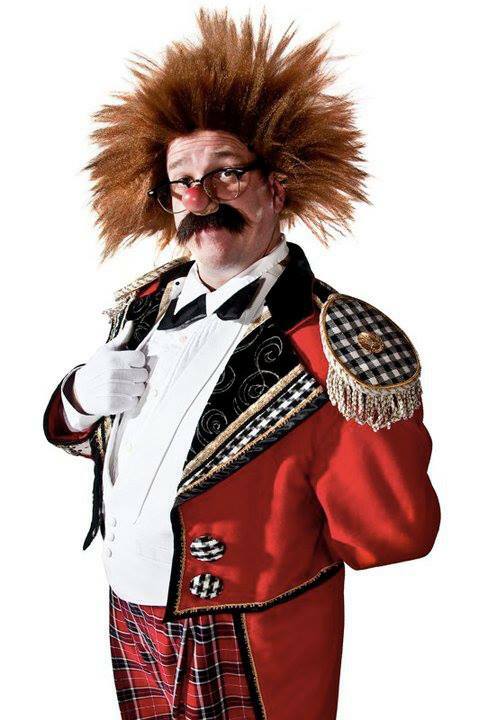 The circus needs a true sense and spirit of showmanship in order to shine. 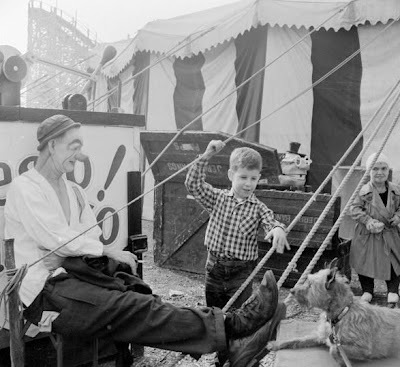 The circus needs a true sense of community and belonging, a sense of SHARED VISION and FOCUS. Without focus on the goal, the results are paltry. Without shared vision and focus, there is no professionalism. Without the professionalism, there is no excellence. The circus is about, should be about one doing the very best to deliver performances that grab the senses, the imagination, and inspire dreams. These things elevate the circus to an art. In its best sense, the circus should be about artistry. We hold our good memories dear and close to our hearts and we long for the "good old days" when such memories were gifted to us through the fine and wondrous performances displayed by talented, energetic, and polished artists of the times when the circus came to or near our towns. Those wonderful memories were created in the present tense back then. Wonderful memories are created today, in the present tense... for today... for the future. It would just seem that there are fewer memories around, being created for the future. We may hear sad and wistful comments in various places longing for acts "like we used to have" back in the day and we may bemoan the difficult atmosphere that exists where it is harder for circuses to do what they have done in earlier years. We may even bemoan the pedestrian efforts of some who proffer what they would pass off as showmanship. We have given in to despair in some ways... we have become fatalistic, complacent... even.. well, even lazy.. this laziness grew over time within the circus community. It can be reversed IF we want it to! There needs to be a renewed attitude among showpeople that says, "Watch me! You ain't never seen anything like this before, and you may never again!" This attitude demands practice and polish and the will to never settle for anything but the best you can do. But this is not the end of it... not the end of the circus... I don't believe it for a minute. The circus is never over unless and until EVERYBODY gives up on it... and you can bet there are plenty of folks out there who are not willing to let that happen. There CAN be a renaissance of the circus tradition... there can be a rebirth of this worthy art form. Good memories are created in the NOW. It's up to any of us out there who haven't thrown out their "give a damn", whether you are one who would be an artist or an audience. Barry "Grandma" Lubin and Jeff "Le Clown Gordoon" Gordon in their water entree from 1991's production Greetings from Coney Island. Charlie Rivel preparing for a performance in Munich January 28, 1971. 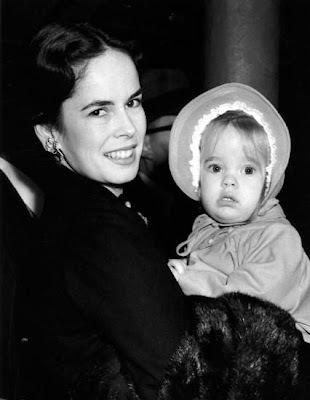 Oona O'Neill Chaplin with her daughter Victoria, whose famous father is Sir Charles Spencer Chaplin (1889 - 1977) the English film actor and director. They had just arrived at Southampton on the Queen Elizabeth in September of 1952. 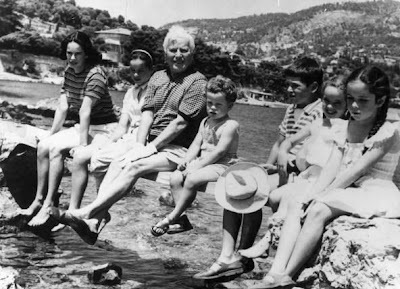 July 15, 1957: British born film actor, director and producer Charlie Chaplin on holiday in Saint Cap Ferrat with his family, (from left) his wife Oona and their children, Geraldine, Eugene, Michael, Victoria and Josephine. Victoria Chaplin (born May 19, 1951) is an American actress, the daughter of actor/comedian Charlie Chaplin and Oona Chaplin O'Neill, the granddaughter of Eugene O'Neill. She was born in Santa Monica, California in 1951. Her siblings are Geraldine Chaplin, Josephine Chaplin, Christopher Chaplin, and Michael Chaplin. With her husband Jean-Baptiste Thiérrée, she created Le cirque bonjour, then Le cirque imaginaire, later Le cirque invisible, modern travelling circuses which some credit as a source of inspiration for the Cirque du Soleil. 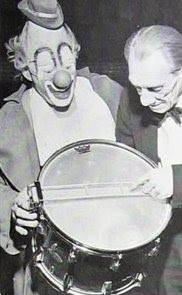 Their son, James Thiérrée, is also an actor and performed as a child in their circus. I was looking forward all week to seeing this at the McCarter Theater in Princeton tonight, only to find that it's been cancelled. Aurelia Thieree is the sister of James Thieree, daughter of Jean-Baptiste Thieree and Victoria Chaplin, grandaughter of Charlie Chaplin and Oona O'Neill and the great granddaugher of Eugene O'Neill. 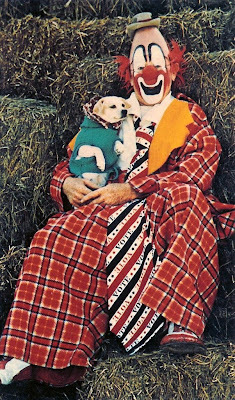 You know, it's hard to believe now but years ago... back before John Wayne Gacy and Stephen King turned us all into monsters, clowns were actually looked upon as one of the simple joys of childhood; "Capricious Ambassadors of Fun!" 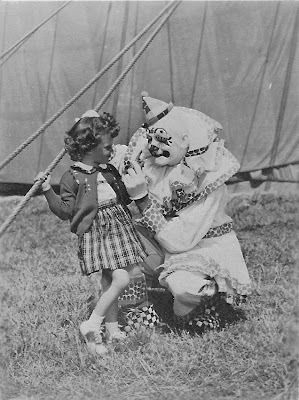 Of course that was back in the days when Circus Day, not a trip to Disney World, was the greatest thing that a kid could imagine. 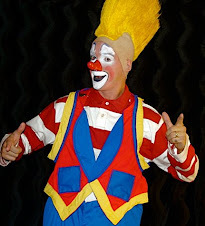 Now, in the age of Shrine Clowns, Hometown Clowns and Macy's Volunteer Clowns we wonder just why it is that television and movies so often portray clowns as humorless, talentless, kid-hating drunks... or worse. 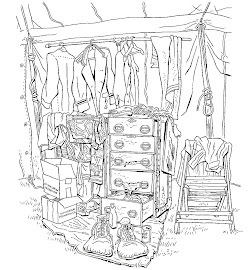 Those left in the circus wear little or no makeup, no wigs, no shoes... none of the exaggerated costuming that once set us apart from the audience and helped create wild imaginative characters that could be seen and identified anywhere in the tent or arena. 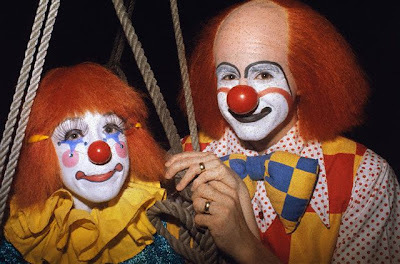 Too many clowns now strive to be "cool" (which is the antithesis of clowning) instead of being what they should be: clowns. This picture depresses me. Not only is one of the people (possibly both of the people) in this photo gone, but so to is the concept behind what the image in this photo so beautifully represents. Todd "Doc Pitchum" Robbins, Barry "Grandma" Lubin and Greg "Lucky" DeSanto ("Lucky" ?) in a soap gag from the Big Apple Circus' Medicine Show, 1996. 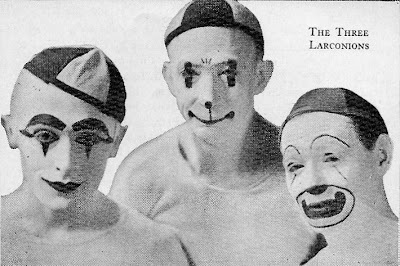 It was seeing this show, watching Lubin and DeSanto, that made me leave standup comedy and finally apply to Clown College. The screams that they got during a school show matinee in Lincoln Center with this gag were absolutely deafening! Barry "Grandma" Lubin, interviewed by Dominique Jando for the Big Apple Circus' latest project CIRCOPEDIA. 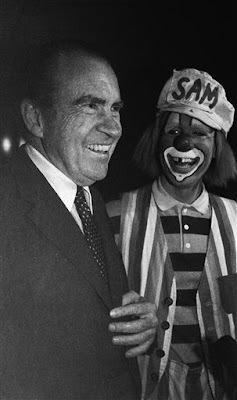 "Former President Richard Nixon shares a laugh with Sam Drummond, a clown from the Ringling Brothers and Barnum and Bailey Circus, at the Brendan Byrne Arena on Nov. 26, 1982 in East Rutherford, New Jersey. Nixon was at the circus with his grandchildren. " Anyone out there know how Sam is doing? 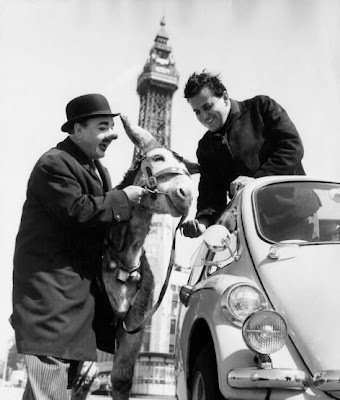 "Clown Charlie Cairoli from the Blackpool Tower circus and his donkey wishes Andre Baldet of Northampton good luck for his 48 hour drive to Paris and back in a Trojan Lambretta bubble car." This was a comedy acrobatic act, the picture is from the Zuhra Temple Shrine Circus program, Minneapolis, 1928. Lou Jacobs with Merle Evans' drummer Red Floyd. 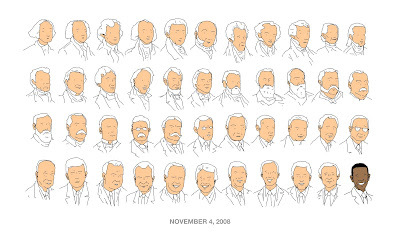 Click here to see who I'm voting for. Happy 29th birthday today to the lovely Ms. Tammy Parish, seen here at Madison Square Garden on May 21st, 1980 following her wedding to Tom. 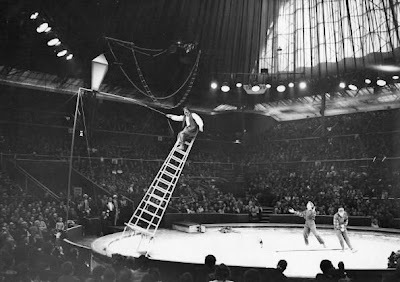 The Ghezzis at the Bertram Mills Circus at Olympia, London on December 18, 1959. 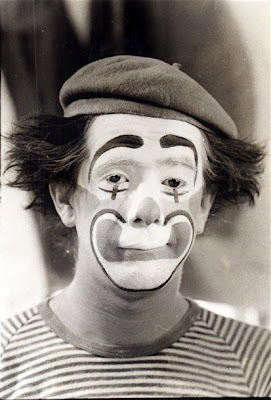 Nicolai "Coco the Clown" Poliakoff, longtime star of the Bertram Mills Circus and father of Michael "Coco" Polakovs, recent recipient of the Lou Jacobs Lifetime Achievement Award. Bill Irwin, David Shiner and the Red Clay Ramblers on the Tonight Show with host Jay Leno and guest Roseanne Barr. Bumpsy Anthony in an undated picture. In the background there is a roller coaster which could be the Cyclone at Coney Island. The trunks behind the boy are marked with Jerry Bangs' name if that helps anyone out there guess the show or the date. For more info on the Platt Brothers please click here. 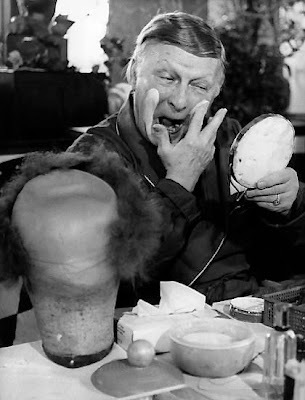 Benny Hill was apparently a big fan of circus comedy and spent much of his time between seasons traveling throughout Europe visiting circuses to watch the clowns. The first part of this video is from Sept. 1975, the second part from Jan. 1981. Here is the call, transcribed it for those who don't feel like downloading and listening to it or who are hard of hearing. For the Frank Sarkozy part, imagine a very thick, fake French accent only slightly better than the ones used in Monty Python's Holy Grail. Things I couldn't make out were placed in brackets. SP Assist: This is Lexi. MA: Hello, Lexi. This is Frank l’ouvrier (Frank the worker], I’m with President Sarkozy, on the line for Governor Palin. SP: Oh...so good, it’s so good to hear you. Thank you for calling us. SP: [Giggle] Oh very good, we should go hunting together. FNS: Some people said in the last days, and I thought that was mean, that you weren’t experienced enough in foreign relations, and you know, that’s completely false, that’s the thing I said to my great friend, the Prime Minister of Canada, Stef Carse [Stephen Harper is the PM]. FNS: Yes, in French, it’s called Du rouge à lèvres sur une cochonne [Translate: Lipstick on a smutty girl (note: I've seen other sites that say this translates to lipstick on a sow)] or if you prefer in English Joe the Plumber, [sings] It’s his life, Joe the Plumber..."
FNS: I just want to be sure, I don’t’ quite understand the phenomenon "Joe the Plumber," that’s not your husband, right? FNS: Yes, yes, I understand, we have the equivalent of Joe the Plumber in France, it’s called, "Marcel, the guy with bread under his armpit, oui." 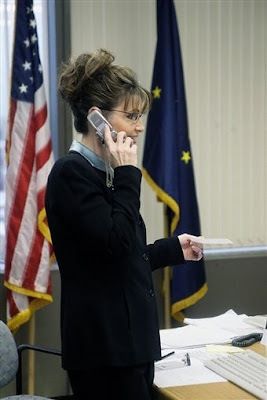 FNS: I must say, Governor Palin, I love the documentary they made on your life, you know, Hustler’s "Nailin Palin."